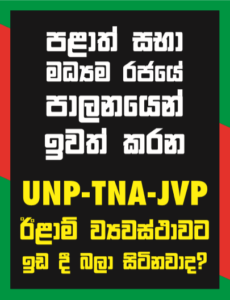 The UNP yesterday predicted that Parliament would be dissolved by the end of this month and a General Election held in July, while the SLFP differed saying the poll could take place only in September. Deputy Defence Minister Ruwan Wijewardena told the “Sunday Island” that Prime Minister Ranil Wickremesinghe had requested President Maithripala Sirisena to dissolve the national legislature latest by the end of this month and they were confident the President would comply, which would make a July election possible. However, senior SLFP’er Susil Premajayanth, MP, who was also General Secretary of the UPFA, said that the earliest time frame for the next election would be September.